The worst news in healthcare is not antibiotic resistance, drug-drug interactions, hospital acquired infections, lack of communication between systems of medical records, and certainly not the alarming rate of obesity in our youth. The worst news is the increasing number of dissatisfied, frankly angry physicians! The physician has been the direct target of assault by the government. The logic has been that if the physician is squeezed to do less, he or she will order fewer tests, few medications, as a result of which the cost of medicine will be reduced. The same logic has been applied to reducing samples of medications to offices and placing more bureaucracy to get authorization for much needed medications and procedures. Simply, more stumbling blocks mean less cost. But this logic has not taken into consideration a slow brewing rebellion by doctors. Over the past decade doctors have been squeezed by insurance companies with decreasing revenues and Medicare payment cuts while the cost of running an office has steadily increased. Insurance companies constantly send threatening letters to doctors to charge less, implicating to spend less time with patients. The advances in medicine have paradoxically caused more concern for doctors: We can do more, but we must contain costs, all the while afraid of being sued for missing a rare but deadly disease. Doctors are broken! I see them walking around campus avoiding eye contact, hardly smiling. When time permits, few break out in quick psychotherapy sessions to complain about the system, the way cancer survivors do. They feel some relief knowing they are not alone. To survive the pressure, fewer doctors are accepting insurance. More are going “concierge,” requiring an annual entrance fee. Many are not taking Medicare or government related insurances. Some demand a credit card on file for incidentals, as do hotels. Some are requesting fees for filling out forms, phone calls, prescription refills, in the same way attorneys charge for work in the client’s absence. 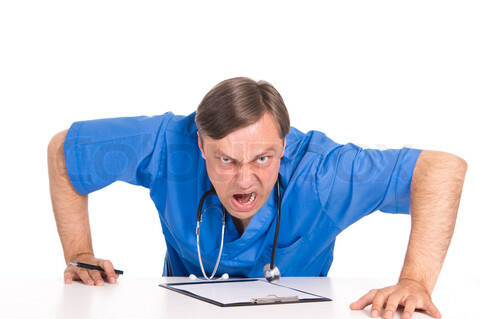 Does our society really think that angry, dissatisfied doctors will deliver better care? What about Obamacare and Affordable Care Act? Insurance premiums will double again in 2015. Patients, too, are outraged when they find out about the large deductibles, large co-pays, and denial of authorizations for tests ordered by their doctors. Most doctors are not accepting or dropping this insurance because of all the hassles. Irritated patients, unable to express their frustration to the insurance companies, turn their anger at their doctors who are the face of the healthcare delivery. Many doctors are making patients sign forms that they are personally responsible for bills unpaid by Obamacare. When I first started rounding in hospitals over twenty years ago, I was regularly asked why I was so happy, smiling all the time. I felt privileged to work in the best health care system in the world. Among the highest reasons given by aspiring medical students for choosing medicine as a profession is job satisfaction. With the unleashed assaults on physicians by the government, stringent reporting requirements, and difficult third party reimbursement, the satisfaction with the practice of medicine is rapidly dwindling. Most of us spend three to five times as much on filling out forms and documentation than in the room talking to the patient who desperately needs us. I no longer walk the floors of the hospital. The electronic medical records mandated by all hospitals now, EPIC, is daunting. Technology and government regulation has become a large elephant squatting in between the patient and the physician; neither can see the other. Required documentation will force office doctors not to round in the hospitals, creating further distance. 2014 marks the official disintegration of the world’s best health care delivery system. Doctors are busy taking care of patients. 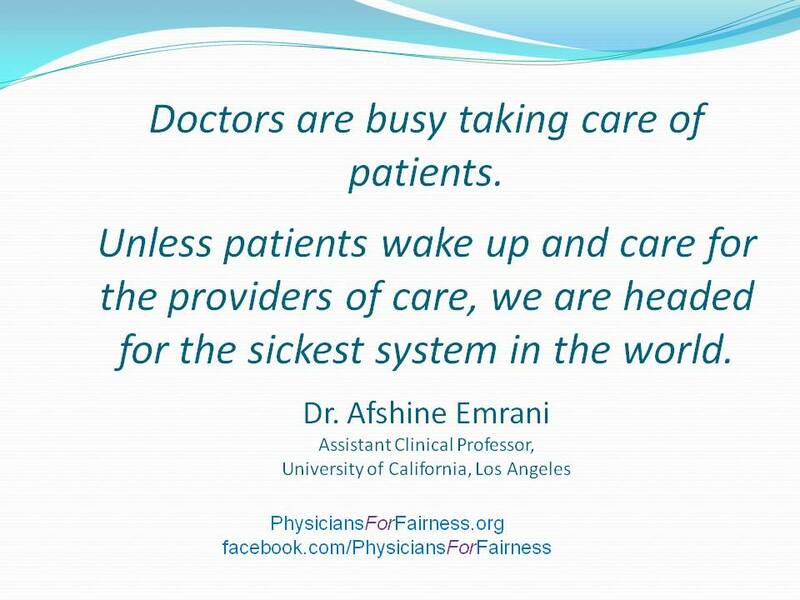 Unless patients wake up and care for the providers of care, we are headed for the sickest system in the world. Afshine Ash Emrani, M.D., F.A.C.C. Dr. Emrani is a Cardiologist in Los Angeles Area. He frequently writes on the following pages.